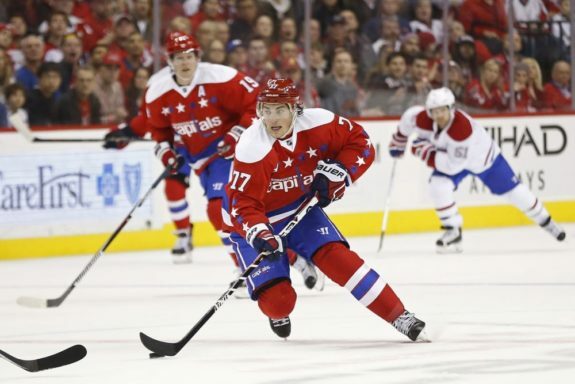 In the third period of the Washington Capitals 5-3 win over the Philadephia Flyers Wednesday, T.J. Oshie felt all the weight come off his shoulders, his arms up in the air as he celebrated his first goal in 13 games with his teammates. It had been a long time coming for the 31-year-old winger, who has been struggling to produce since returning to the lineup after sitting out six games with a concussion in December. He’s played in 16 games since coming back from injury, but has just two goals and seven points over that span; however, he has six points in his last nine games and appears to be turning his game around. According to Oshie, he’s been making adjustments to his game, which include longer time on the ice at practices and different tape jobs, in order to try and ignite a spark to improve his play. In an effort to help Oshie overcome his scoring woes, head coach Barry Trotz put him on the third line with Lars Eller and Brett Connolly, two players who provide a lot of grit and drive, and also have tremendous chemistry. And, that ultimately seemed to do the trick, as Oshie found himself not only clicking with his new linemates but finding his speed and momentum, which helped him drive the net, crash the crease and create more scoring chances. According to winger Brett Connolly, Oshie brought a lot to the line, and his energy and ability were prominent with his shift to the third line. Trotz first put Oshie on the third line in a Jan. 7 against the St. Louis Blues in hopes to ignite offense throughout the lineup. Almost immediately, Oshie responded and found himself playing with more energy and getting more scoring opportunities. He finished the game with two assists to snap a frustrating five-game point drought. Since then, he’s brought a lot more speed to the table and has spent a lot of time playing with that line and hitting his stride, which ultimately carried him back to the top six. Now, he’s playing alongside Nicklas Backstrom and Andre Burakovsky, a line that he believes can click well, especially because of Backstrom’s versatility and ability to play with pretty much anyone. With 32 games left on the schedule, the Capitals are not only looking to maintain a commanding lead over the Metropolitan Division but to also maintain a lot of scoring depth so that they can have a strong playoff run come April. And, according to Trotz, Wednesday’s victory, which saw Oshie, Burakovsky and Chandler Stephenson all ending lengthy scoring droughts, proved that Washington has a lot of depth and scoring on their forward lines. “I think it builds some confidence, because we’ve had some guys who’ve been a little dry,” Trotz said. “Obviously I was happy for [Burakovsky], I was happy for [Oshie], it’s been a while. I think that’s the key, is getting contributions right through your lineup. When we’re getting that, we’re usually pretty dangerous.